Words With Friends (Free) became one of the early ambassadors of mobile gaming when it launched 8 years ago, finding its way to the phones of many who wouldn’t call themselves “gamers" at that point in time. To celebrate its 8 anniversary, Words With Friends continues its growth but this time around we are getting pop-culture inspired words that might make the language purists among you (or the older ones among you) cringe. We are getting words suggested by other players or ones that you hear about often, so expect to earn points for words like Delish, Queso, Bae, Bestie, Hangry, Smize, BFF, and many other ones most often seen on Instagram and Twitter rather than dictionaries. We can start debating what makes a word a word or whether TFW should be in a Scrabble-like game, but the fact is these words are extremely popular and are slowly making their way into official dictionaries. So, I think they are fair Words With Friends game. 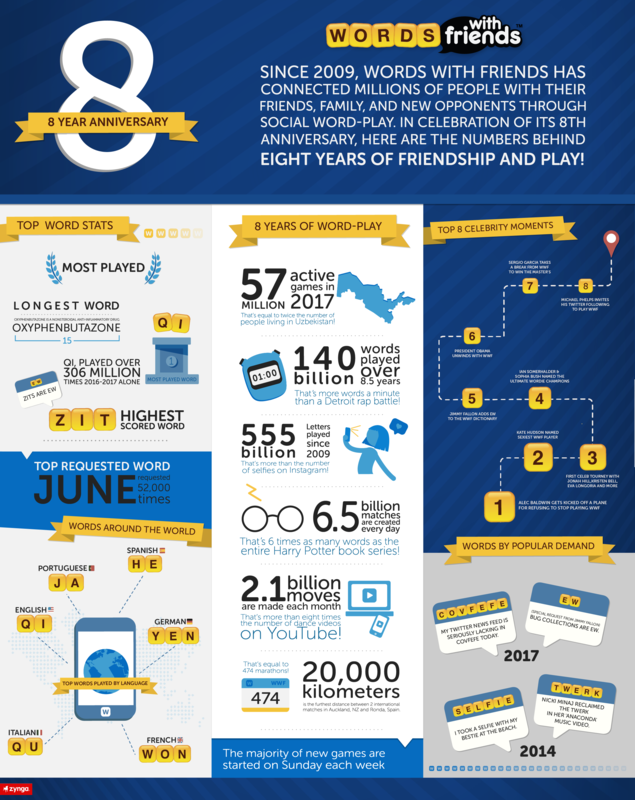 In addition to adding all these new words, Words With Friends released some pretty crazy stats that demonstrate the game’s popularity over these 8 years. For instance, in 2017 alone an estimated 57 million active games are being played around the world at any given time, with 6.5 billion matches completed each day. Ever since its launch in 2009, 555 billion letters have been played. And, in case you were wondering, the most played word of the game is QI. The new Social Dictionary words are available starting today, so go play with your Bestie or BFF (or even Bae), unless you’re getting too Hangry ATM.